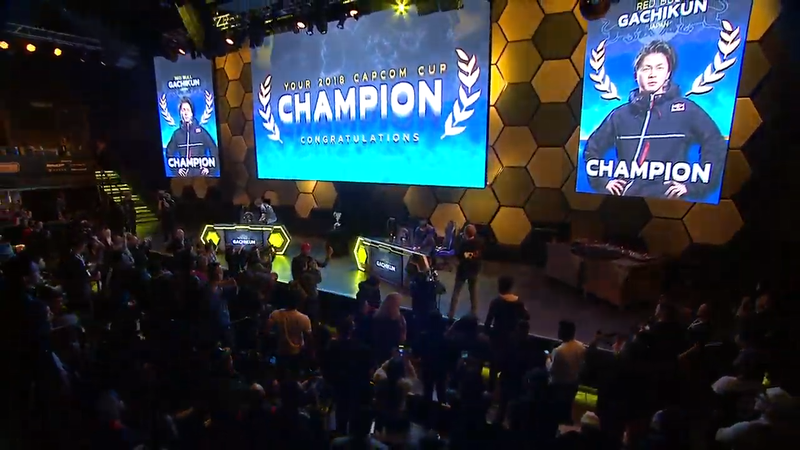 There is a new best player in the Street Fighter world, as Gachikun wins Capcom Cup 2018. The 2018 Capcom Cup has concluded and there is a new top player in the Street Fighter world. After an incredible weekend where the stars fell quickly and often, the last player standing is Kanamori "Gachikun" Tsunehori. He emerged victorious in an epic Grand Finals against Hiromiki "Itabashi Zangief" Kumada. Itabashi Zangief's Abigail came in with the size advantage, along with the potential for late game comebacks. Gachikun used Rashid's speed advantage and his swiftness to land strings of combos and consistently cross the bigger Abigail up. But it wasn't enough to overcome Abigail's V-Trigger I, which adds to the behemoth's power game, allowing him to depelete over half of Rashi'd health bar in a single combo. Itabashi Zangief easily took the first set 3-0 to reset the bracket. Gachikun gave himself a cosmetic makeover for the second set, switching to Rashid's Red Bull outfit, partly as a shoutout to his sponsor, Red Bull Gaming. A more practical change was the switch to Rashid's V-Trigger II. It gave him wings early, allowing him to take a quick 1-0 lead. Gachikun kept up more of the same, dodging Itabashi's power moves, and went up 2-0. Itabashi showed off Abigail's comeback potential in the third game, using Abi's V-Trigger I to get hiimself on the board. But Abigail's power wasn't enough to keep Itabashi going, as Gachikun polished him off in the final game to win the tournament. Both Itabashi Zangief and Gachikun weren't expected to make it this far. Gachikun finished 18th on the Capcom Pro Tour standings, while Itabashi Zangief finished 24th. But as mentioned, this is the tournament where the stars fell. CPT points leader Hajime "Tokido" Taniguchi, EVO World Champion Benjamin "Problem X" Simon, and Keita "Fuudo" Ai were rocked by early upsets and all missed the Top 8 cut. The only name at the top of the leaderboards to make it all the way was Fujimura Atsushi, who finished in 3rd place and ultimately lost to both Gachikun and Itabashi Zangief. For his win, Gachikun receives $120,000, while runner-up Itabashi Zangief gets $60,000. However, that's just from the base $250,000 prize pool. The final pot will also include proceeds from Street Fighter V: Arcade Edition's CPT 2018 DLC sales.